The Dark Knight had all other movies beaten before it even entered the cinema. With a viral marketing campaign like few had seen before, the whole web was littered with hidden messages, clues and riddles designed to whip fans into a frenzy over the films encroaching release. Today Iron Man 2 started down the same road, releasing this image exclusively to SuperheroHype. 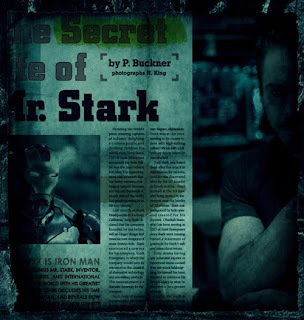 Continuing inline with the newspaper background of yesterdays Whiplash poster, the news clipping covers the events of first Iron Man movie, with the word 'Secret' mysteriously highlighted in the heading. Maybe I'm being a grump, but a viral campaign for Iron Man 2 seems a little...pointless. The Joker was a character that lent itself to the kind of weird, mysterioso viral marketing that they did, but the Iron Man movies are thoroughly unmysterious. I mean, Whiplash? Really? To be honest Rob when I saw the image, I thought they even kinda made Tony Stark look 'Joker-ish' to get the ball rolling. As for Whiplash I hope the inclusion of Justin Hammer in the film means it will be like the old I.M comics, where Hammer was a crooked businessman with an army of super-powered heavies (kinda like the Taskmaster is now) that could work. But on his own, hmm... like you say it will be interesting to see how it all comes together.